Working at AMS headquarters in Boston, several things become almost second nature to our daily work life. One is that we work in an amazing location: on Beacon Hill, directly across the street from the beautiful Boston Common. The other is that AMS has quick access to some truly smart scientists and experts in nearly all areas of the atmospheric sciences. These two aspects intersected when I went out for lunch one day on the Common. The sun was at its midday peak, and a high-pressure system was located to our west, which meant that we had a bright blue sky overhead. It was then that I noticed something I’d never seen before in my life: a single cirrus cloud, low on the horizon and drifting east, that was entirely rainbow colored. It took me a second to realize I was seeing a very strange atmospheric phenomenon, and I did what most people would probably do: photographed it and sent it off to social media. I got lots of comments about this unique optical phenomenon, including some who said they thought it might be a sundog, cloud iridescence, or a solar halo. 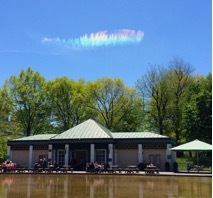 I also asked several AMS members and staff to help identity what I had called a “rainbow cloud.” After some digging around, and much e-mail activity, the consensus was that this must have been a circumhorizontal arc. There is an AMS Glossary of Meteorology definition to match and also a Wikipedia page. Circumhorizontal arcs are rare solar arcs that occur when certain atmospheric conditions are in place, including a high-altitude sun (with an altitude angle above 58°) and a cirrus cloud at or below 32° above the horizon. In this case, we speculated the cloud was a lingering airplane contrail. The sunlight passes through the ice crystals in the cloud, bending (refracting) twice: first upon entering the side face of each crystal, and then upon exiting through the flat base of each crystal. As in a prism, the refractions separate the colors of the spectrum, with red on the top portion, nearer the sun, and blue/violet on the lower portion. At Boston’s latitude, the brightest circumhorizontal arcs occur only around midday near the summer solstice—in other words, this was a perfect time to see this splendor. Although we only see a piece of it, the full arc would ring the sky, parallel to the horizon. (By contrast, halos ring the sun, with a separation of either 46° or, more typically, 22°). Because the circumhorizontal arc is “horizontal,” it allows the contrail/cloud drifting along the horizon to maintain its vibrant colors much longer than it would if it were passing through the curve of a halo. I was thrilled to have seen such an impressive anomaly during lunch, along with many other Bostonians who happened to look skyward. The evening news covered the story in depth because so many people had shared it on social media. I felt doubly fortunate as an AMS staff person to have so many experts able to help me understand what I’d witnessed.